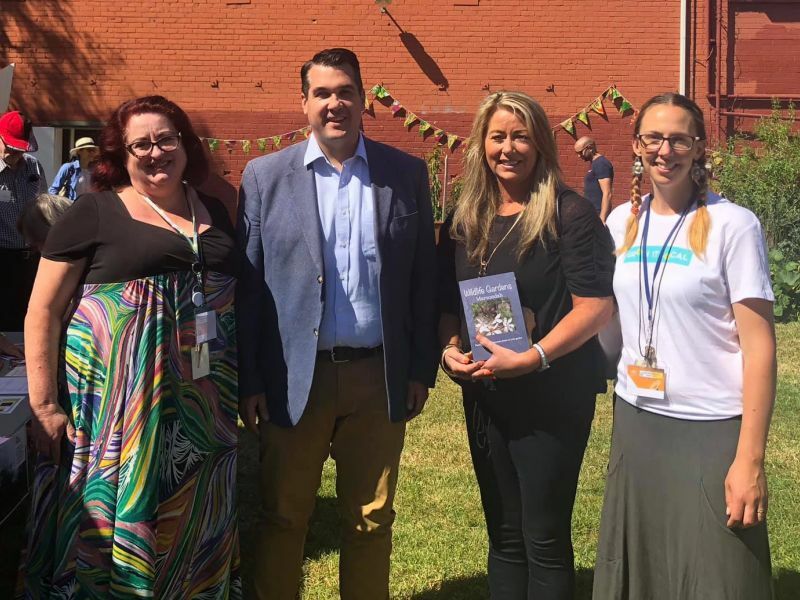 At last Sunday's Sustainability Fair at Central Ringwood Community Centre, it was announced that the State and Maroondah Council will jointly fund the community centre and garden to the tune of $250,000(!). This will fully fund the centre as a sustainability hub as well as develop the community garden. Congratulations to newsletter reader Jess Ness, who has been instrumental in getting the funding. Near right is a picture of Jess (who is on the far right), together with various local dignitaries just after the announcement was made. There were lots of other newsletter readers at the fair. Far right is a picture of two of them, Claire and Jenny, manning the Outer Eastern Permaculture Swap stand. 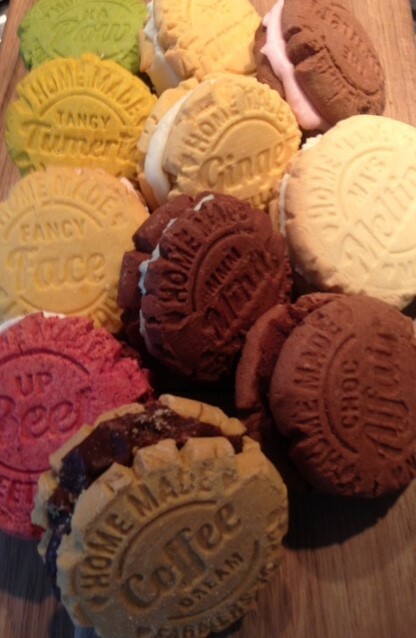 The Farmers Yo Yo, who are based in Blackburn North, make yo-yo shortbread biscuits using all-natural, all-Australian ingredients. There are around 14 different flavours (including chocolate, coffee cream, lemon, mint slice, mocha, raspberry and vanilla). 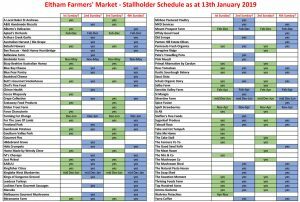 You can buy their yo-yos at Eltham Farmers’ Market – they have a stall on the 1st and 3rd Sundays but are also making a surprise appearance at next Sunday’s market (i.e. on 27th January). Read their Local Food Directory entry. Welcome Renee! Want to help save Peppertree Place? 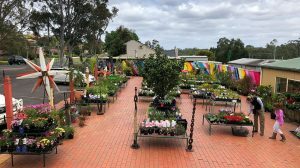 In our 15th August newsletter, we wrote about the imminent demise of Peppertree Place in Coburg and, in our subsequent 12th September newsletter, we wrote that it might have been saved. Well, it turns out that it all depends on whether or not they can cover the lease on the property. To this end, they have started a crowdfunding campaign. 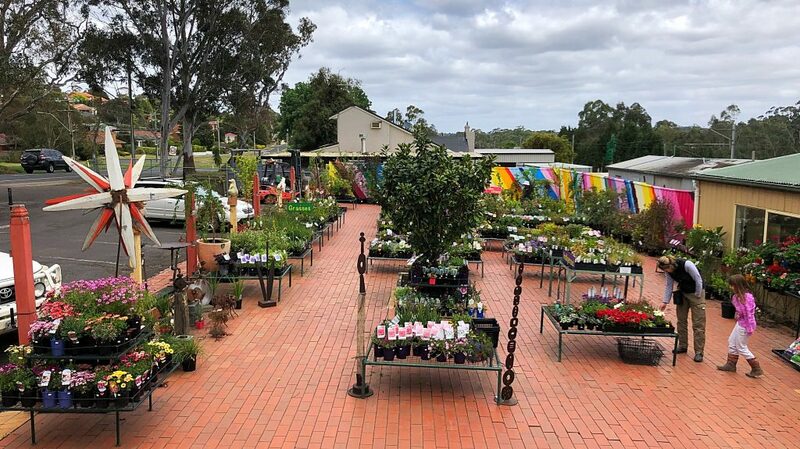 In mid-2018, Sarah Watson, newsletter reader and Wattle Glen resident, took over Nillumbik Nursery (235 Main Hurstbridge Road, between Diamond Creek and Hurstbridge) in partnership with Bulleen Art and Garden. There is a new range of both food plants & natives and the nursery now sports new colourful walls & garden sculptures. A fern room is being built and a palm corner is being planned. As Sarah says: “Our team – Felicity, Kate, Allison and Sarah – are sharing our love of plants and nature, encouraging healthy local food production, and passionately working to create a greener future for Nillumbik.” Sign up for their newsletter which, inter alia, entitles you to 5% off plants. 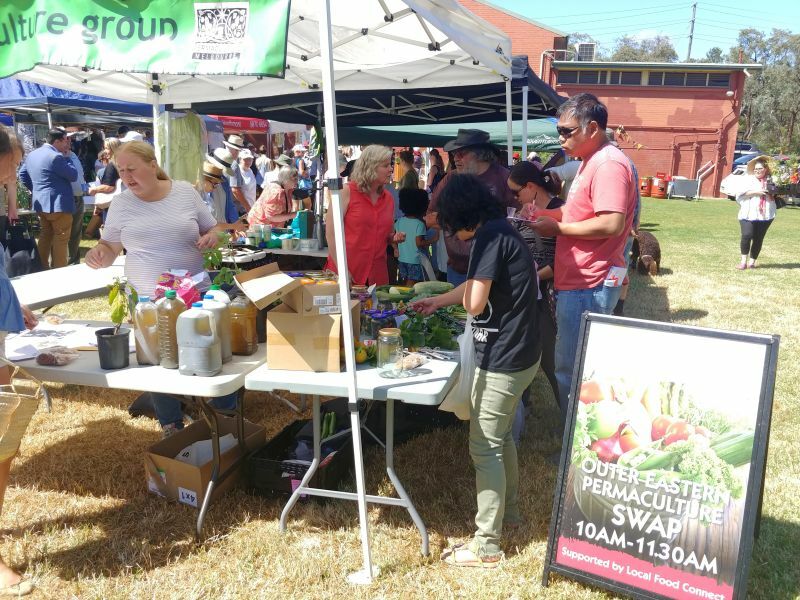 The market on Saturday, 26th January at Abbotsford Convent will be the last Slow Food Melbourne Farmers’ Market before it moves to Spotswood. As announced on their blog, the Abbotsford Convent Foundation has appointed Melbourne Farmers Markets to operate a farmers’ market at the convent from February onwards. Slow Food Melbourne published a Facebook post on the subject which has attracted hundreds of comments and shares; that post gave a link to an article which discussed some of the history, but that article has since been deleted. You can now buy Healthybake’s bread and Offaly Good Food’s pate at Organic Fix in Eltham. 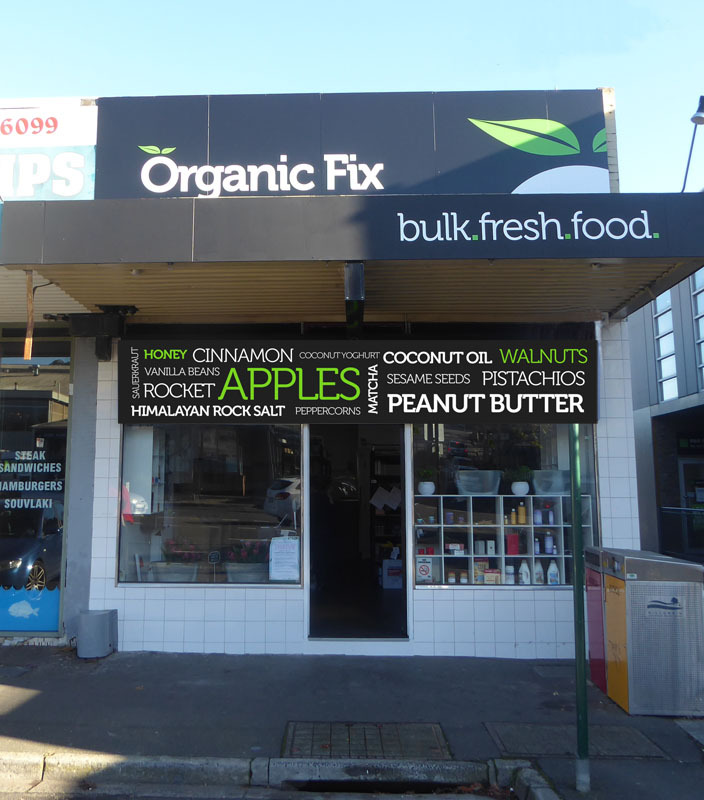 This moves Organic Fix into 3rd equal position in our league table of local sellers of local produce. The annual Home Harvest Picnic will be held at Edendale on Sunday, 31st March. More info next week. Read this page on the ABC News website for newsletter reader Richard Rowe’s tips on being a water-smart gardener. Richard was also interviewed on ABC Radio Melbourne. What is the purpose of fruit? As we have discussed before, grasshopper, the purpose of most fruit is to be eaten by an animal who, at a later time and hopefully elsewhere, excretes the seeds that were contained within the fruit and thus helps the plant to disperse. What animal could possibly excrete an avocado seed (aka pit)? Avocado trees are native to Central America. The largest frugivores in Central America are tapirs. According to a 2013 paper entitled Frugivory and seed dispersal by tapirs, the maximum size of seed that a tapir can excrete is around 2cm in diameter. Avocado pits are typically 5cm or more in diameter. So, the answer is not tapirs! According to a 2009 paper entitled Using dung bolus diameter for age estimation in an unstudied elephant population in Udzungwa Mountains, Tanzania, elephant dung can be up to 18cm in diameter and so elephants could presumably excrete an avocado pit. But there are no elephants in Central America, and never have been. So, the answer is not elephants! Rather, the answer is apparently megafauna which have now gone extinct, such as giant ground sloths (genus Megatherium). Given the demise of the megafauna, how do avocado trees disperse nowadays? Without human assistance, they can’t. In other words, the avocado is ‘an evolutionary anachronism’ which is no longer able to manage its seed dispersal. Read the discussion on the Smithsonian website. Or if, like Donald Trump, you prefer to get your information by watching rather than by reading, watch and listen to a video of someone called Connie Barlow singing a song entitled Ghosts of Evolution (which is actually worth watching). Bonus factoid: in researching this little article, I happened to find out that one of the most expensive coffees in the world is made from coffee beans that have been consumed and then excreted by elephants – see Wikipedia. You can buy this coffee online. 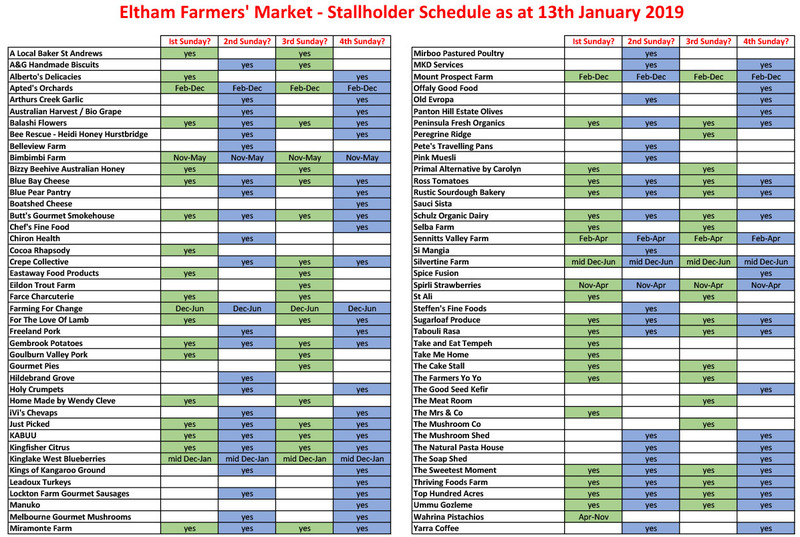 The graphic of the current stallholder schedule at Eltham Farmers’ Market – see picture right. Why didn’t the butter take the part in the new movie? Because it didn’t like the roll it was offered. Trump to the left of me. Stuck in the middle with EU. For some time, the calendar on the website has drawn a distinction between cooking events and non-cooking events. I’ve now decided to make that same separation in the newsletter. So, the non-cooking events are discussed below, with the cooking events in the following section. design, plant and maintain productive gardens. You will learn all the steps involved in creating a garden, including how to select the best site, through soil preparation, different types of growing methods, organic pest management, companion planting, irrigation, maintenance and harvesting. When: Thursdays from 31st January to 4th April (10 weeks), 12.30-2.30pm. Where: Span Community House, Thornbury. Cost: $278 ($253 concession; $22 ACFE). Bookings: by phone (9480 1364). What: Facilitator: Visit the coolest sustainable projects in Brunswick East. From local roasters, urban beekeepers, colourful ethical design stores, devoted bike savers, dedicated organic food growers and bean-to-bar chocolate makers – dive into sustainability in all shapes and colours. Check out 4-5 green initiatives, taste delicious food, learn about handmade products and chat to the people behind the counters. When: Saturday, 2nd February and again on Friday, 15th February, both 1-4pm. Bookings: 2nd February and 15th February. What: This workshop will leave you feeling confident about what you can plant in March and beyond. It will give you new ideas on what you can grow and things to do in the garden over the cool season. To help solidify your knowledge, you will take a walk around the community garden to identify crops that are thriving, those that are struggling, and common problems. When: Wednesday, 6th February, 6-7.30pm. Where: Lygon Street Community Garden. What: Devita Davison, Executive Director of FoodLab Detroit will tell the story of the good food movement in Detroit, and the push to build a vibrant food economy in the wake of the decline of the automobile and other manufacturing industries. Devita will describe how the Foodlab Detroit has supported social enterprise to improve the health and social wellbeing of Detroit communities, and increase diversity and equity. She will share the case studies of diverse groups of local entrepreneurs, the skills and confidence they’ve developed through the Foodlab Detroit program, and the challenges they have overcome to establish food businesses and grow a more equitable food supply which honours identity and culture. Listen to Devita’s TED interview. When: Thursday, 7th February, 10.30am-midday. What: Stuart and Christine have developed their 1 acre lot, on a sub-divided former orchard, into a home with a large variety of food producing plants. Starting with a thin layer of poor Eltham soil, they have brought in many soil improvers including minerals, manures, lignite (brown coal), sawdust, charcoal and coffee grounds to create a deep fertile soil for vegetable growing. They use low cost, low maintenance ‘chemical-free’ techniques based on permaculture ideas to get good yields of healthy food, and to maintain soil fertility with a view to minimising future external inputs, for example by growing green manure in winter, recycling waste on-site, and minimising leaching of nutrients by minimising runoff. Well behaved children under direct parental supervision are welcome free of charge. When: Saturday, 9th February, 11am-midday. What: A South-East Asian vegan-only degustation event at Rice Paper Scissors. The ticket price includes at least 10 rounds of tasty plant-based delights. Choose your start time. When: Saturday, 9th February and again on Saturday, 9th March, both 11.30am-4.30pm. What: Facilitator: Monique Miller. Taste the edible weeds of Melbourne. Eating weeds, or ‘plants in the wrong place’, is potentially an important part of an energy-decent future, as we creatively respond to the changing climate. Knowing which weeds and wild plants are edible is empowering, as it helps people become self-sufficient and resilient with their food choices. When: Saturday, 16th February, 10am-midday. What: This workshop will teach participants how to assess the watering needs of vegetables, herbs, fruit trees and bushes, and plants in pots. Both under watering and over watering are a waste of water, so it’s important to understand how much water is required for plants to grow healthily whilst conserving as much water as possible. When: Saturday, 16th February, 3-4.30pm. Where: Macleod Organic Community Garden. What: The dinner comprises 3 share-style courses which highlight 3 ethical local producers. The evening will include a panel Q&A with the three producers. Alcoholic and non-alcoholic beverages will be available to purchase at the bar. When: Saturday, 16th February, 7-10pm. What: Facilitator: Marina Bistrin. Learn all the secrets of weed composting. Weeds are nutrient-dense and many can be easily cold composted without re-growing. Many households cannot easily amass enough material to create a hot compost; instead, you can build up a slow compost with small amounts of food and garden waste, using additions saved from landfill, such as coffee husks and grounds. When: Sunday, 17th February, 9.30-10am. When: Sunday, 17th February, 11.30am-12.30pm. What: Farmer Incubator will be running its ‘Pop up Garlic Farmers’ program commencing in March. All aspiring sustainable farmers are invited to go along to meet the team and previous participants. This event will introduce and discuss the farming opportunities that this program presents. When: Tuesday, 19th February, 5-8pm. What: What you will learn: an understanding of the beekeeping season and the guidelines for effective and safe hive management; the best ways to get started as a beekeeper; and extracting honey. What you will get: the practical skills and know-how to get started and/or continue on your beekeeping journey; and the opportunity to taste and purchase honey fresh from a hive. This is an introductory course to beekeeping to provides you with an insight into the skills and experience required to operate a backyard beehive, whether you are interested to start on a beekeeping journey or already have some experience. When: Tuesday, 19th February, 6-7.30pm. What: The event will cover all the basics of plant selection, pollination, harvesting, drying, cleaning and storing seeds for common vegetable varieties. When: Tuesday, 19th February, 6.30-8.30pm. What: Facilitator: Marina Bistrin. Learn all the secrets of weed composting. Weeds are nutrient-dense and many can be easily cold composted without re-growing. Many households cannot easily amass enough material to create a hot compost; instead, you can build up a slow compost with small amounts of food and garden waste, using additions saved from landfill, such as coffee husks and grounds. Also, participate in a veggie swap. When: Sunday, 24th February, 10.30am-midday. What: This workshop will guide you through the basics including soil and plant nutrition, pest control, traditional and no-dig veggies patches, and easy herbs and veggies to ensure first time success. Discover low- or no-cost organic methods and how to growing pots for renters and people with courtyards or balconies. When: Tuesday, 26th February, 6.30-8.30pm. What: Are you already started in beekeeping but want to know more? Maybe you are just looking to learn more about how to manage a beehive as part of your permaculture setup. This workshop will provides you with an insight into the skills and experience required to safely and effectively manipulate a beehive and carrying out general management practices. It will also provide you with a broad understanding of the history and biology of a colony of European honey bees. At the end of the course, participants will know what steps need to be taken to get started in beekeeping. When: Wednesday, 6th March, 1-2.30pm. What: Participants will learn how to make and maintain their own beeswax wraps for keeping food fresh and hygienic without the use of single-use plastics such as cling-wrap. This is a hands-on workshop where participants will make their own ready-to-use beeswax wraps and learn skills that are transferable to the home environment. When: Wednesday, 13th March, 1-3pm. What: The evening will start with David Holmgren, co-originator of the permaculture concept, presenting ‘Aussie Street’, a speculative eco-narrative, seen through the microcosm of four adjacent houses and the humans living in them, which shows the changing face of the suburbs over the last 50 years and the effects of change according to needs/ population/ economy. This will be followed by a musical interlude. David will then be joined by a panel consisting of Su Dennett, Kat Lavers and Christopher Anderson to discuss “Putting Retrosuburbia into practice in your home and in your life” and respond to questions from the audience. When: Thursday, 14th March, 6.30-9pm. What: Facilitated by Olwyn Smiley from The Backyard Vegetable. You will look at some strategies for successful propagation whilst also giving a second life to ‘waste’ materials. When: Saturday, 16th March, 2-3.30pm. What: Facilitator: Catherine Donnelley. Learn cooking skills in this hands on and demonstration class. Using fresh seasonal ingredients and garden produce, learn planning, preparation and presentation skills. This class is supported by program staff as well as an experienced cook. When: Tuesdays from 29th January to 2nd April (10 weeks), 10am-12.30pm. Cost: $408 ($371 concession; $67 ACFE). What: Facilitator: Monique Miller. This workshop will introduce you to the world of lacto-fermentation, a method for the preservation of vegetables, dairy, and even bread doughs, using beneficial bacteria. The ancient process of fermentation creates nutritious and delicious foods that do not require refrigeration. Learning to ferment foods at home can help reduce food waste and energy usage. You will go home with their own products to ferment at home. When: Saturday, 9th February, 10am-12.30pm. What: Learn how to make some easy lunches and snacks in the Thermomix. They will also be taking a look at the cookkey and cookidoo. There will be samples to taste and the children can stay entertained at their playdough station. When: Sunday, 10th February, 2-4pm. What: Facilitator: Catherine Donnelley. Experience and enjoy demonstration and hands-on cooking, sharing recipes and using seasonal produce. This class is for participants living with or recovering from a mental health illness, have a mild disability or a long term condition. Family carers looking for a social connection are also encouraged to attend. HACC-PYP and CHSP supported. When: Tuesdays from 12th February to 2nd April (8 weeks), 1.30-3.30pm. What: This class will explore traditional and contemporary recipes from the Thermomix Flavours of India cookbook and recipe chip, and will show you how to make them confidently in your Thermomix. The demonstration will include: chai masala tea or lassi; paneer; garlic paste; garam masala powder; tandoori paste; chicken korma; coriander chilli chutney; rava payasam; tarka dal; steamed white fish with tomato and Indian spices; garlic and coriander naan; and paneer makhani. All menu items will be available for tasting. When: Friday, 1st March, 6.30-8.30pm. The non-cooking events are discussed below, with the cooking events in the following section. Emma Grace – beeswax wraps: Wednesday, 23rd January, 10am-midday. Introduction to gardening (10 sessions): Thursdays from 31st January to 4th April (10 weeks), 12.30-2.30pm. Clifton Hill rental productive garden: Saturday, 2nd February, 10-11am. Northcote rental productive paradise: Saturday, 2nd February, 10-11am. festival21 – starting young (kids program): Saturday, 2nd February, 11am-12.30pm. Clifton Hill rental productive garden: Saturday, 2nd February, midday-1pm. Northcote rental productive paradise: Saturday, 2nd February, midday-1pm. festival21 – what should I eat? : Saturday, 2nd February, 1pm-2.30pm. GreenMe Brunswick tour: Saturday, 2nd February, 1-4pm. festival21 – navigating food landscapes: Saturday, 2nd February, 3pm-4.30pm. festival21 – can we eat our way out? : Saturday, 2nd February, 5pm-6.30pm. festival21 – the food chain: Saturday, 2nd February, 7-10.30pm. Fruit for your backyard workshop: Sunday, 3rd February, 10-11am. Summer fruit tree training workshop: Sunday, 3rd February, 1-2pm. Farm play: Tuesday, 5th February, 10am-midday. Bush skills and kids farming: Tuesday, 5th February, 4-5.30pm. Poppy’s patch: Saturday, 9th February, 10-11am. Coburg secret garden: Saturday, 9th February, 10-11am. Stuart and Christine’s garden: Saturday, 9th February, 11am-midday. Pop up garlic farmer information evening: Tuesday, 19th February, 5-8pm. Become a junior chocolatier: Wednesday, 23rd January, 45 minute sessions starting at 9am, 10am, 11am, midday, 1.30pm and 2.30pm. The Beet Retreat – healthy vegan cooking class (gluten free): Thursday, 24th January, 6.30-8.30pm. Cooking for all abilities (10 sessions): Tuesdays from 29th January to 2nd April (10 weeks), 10am-12.30pm. The Beet Retreat – healthy vegan cooking class (gluten free): Thursday, 31st January, 6.30-8.30pm. No Waste Cook Club: Saturday, 2nd February, 10am-midday. The Beet Retreat – eating vegan on a budget (4 hour): Sunday, 3rd February, midday-4pm. Danish dark rye bread workshop: Saturday, 23rd February, 2-4.30pm.